Scott Hick’s 1999 film adaptation of Guterson’s best selling book simply left me cold. Imagine my shock when I was blown away by one of the best productions I’ve seen on a stage in Portland. McKeon’s adaptation is simply amazing and coupled with Chris Coleman’s pitch perfect direction and uniformly excellent acting, Snow Falling on Cedars at Portland Center Stage is nothing short of a triumph. Set in the late 40’s and early 50’s, Snow Falling on Cedars follows the trail of Kabuo, a Japanese American fisherman accused of murdering a fellow fisherman in a small northwestern island town. The play flashes back and forth between the trial and the years leading up to it, covering the interweaving stories of the characters. Smack dab in the center of Snow Falling on Cedars is a look at the Japanese internment camps in America, enacted after the bombing of Pearl Harbor. Although Snow Falling on Cedars covers an important point (and arguably one of our lowest points) in American history, the play is more about the relationships and connections between the people involved than the history itself. Olivia Oguma and Vince Nappo play Hatsue and Ishmael, two childhood playmates who flirt with something more. Their relationship comes to a head with the bombing of Pearl Harbor. There’s a devastatingly beautiful moment when Hatsue turns to Ishmael and says, “Look at me, look at my face, I have the face of the enemy!” It’s within a moment like this between characters that brings everything together and adjoins the greater narrative, the historial context and makes this play work so well. A lot of credit goes to Kevin McKeon for his masterful adaptation of Guterson’s book. McKeon covers considerable ground in his stage play and really has a sense of how to capture and present the soul and essence of the book. McKeon often gives us just enough of a glimpse at something as he weaves back and forth throughout the lives of the key characters. This results in some truly magical moments, and while fleeting, they give us a tremendous amount of insight and connection with the story. One of my favorite moments of the play involves the coupling of Hatsue and Kabuo, a short scene played perfectly, almost magically; I’ll surely be thinking back to it a long time from now. Director Chris Coleman, who has been playing around with inventive and minimalistic staging this year, really hits his groove working with McKeon’s adaptation. The staging transitions from scene to scene, emotional note to emotional note flawlessly. At one point we flash between the front lines in the South Pacific to a quiet and tender scene between two of the characters on the field of an internment camp and back again. Coleman’s actors never seem lost in the shuffle and he gives them a tremendous amount of faith and trust to carry off some of the most important elements of the play. In one scene two police officers, played by Scott Coopwood and Casey McFeron, pull a body caught in a fishing net out of the water and onto a boat. This entire scene is done using pantomime, and it executed so well you’d swear they had a real body on stage. I couldn’t help but think back to Coleman’s work on Ragtime and the show-stopping scene where Gavin Gregory (who plays Coalhouse Walker) sits down to play at an invisible piano. It’s this kind of deep trust in the artform and the capacity of his actors that makes Chris Coleman a truly great director, and under his direction, the actors rise to the occasion. Olivia Oguma gives an award worthy performance as Hatsue, carrying her character through a huge life arch from pre-teen to a married woman with kids. Vince Nappo takes his character Ishmael on a similar journey and caps the show with an emotional moment that is simply amazing. Bruce Locke gives the role of Kabuo a rich texturing despite the fact that his character is extremely reserved. Across the board the performances in Snow Falling on Cedars are excellent even though many of the cast members double and triple up, playing a variety of roles throughout the show. My one and only gripe about the production is its opening. The characters come on and speak in narrative to set things up. It works but not nearly as well as when we see the characters interact with dialogue. Admittedly, this is a minor issue and in many ways is like complaining about the frame on a true masterpiece, which is what this is. Kevin McKeon’s adaptation of Snow Falling on Cedars is so good and Chris Coleman’s Portland Center Stage production is so well performed it has the potential to become a truly classic piece of theater. McKeon works magic with Snow Falling on Cedars, crafting a truly contemporary theatrical experience using classic theatrical tools, and in the hands of Chris Coleman the result is simply amazing. Snow Falling on Cedars has the potential to be the kind of show that moves on from its Portland debut to New York and then beyond. It’s a truly great piece of theater and is absolutely not to be missed. 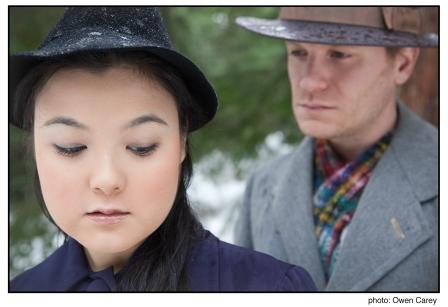 Snow Falling on Cedars plays at Portland Center Stage 1/12-2/17. Tickets Start at $35. I wholeheartedly agree with the above critique and I would add that from an historical point of view, the story expressed an accurate attitude of that time. When Pearl Harbor was bombed, fear and distrust overrode the admiration many caucasians had felt for the Japanese. I remember my mother telling me how hard the Japanese worked in the fields around Gresham, where she lived. She had a tremendous admiration for them and felt so sad when they were treated badly. It is good to present these blights in our American history to help Americans understand the negative power of fear and learn to respect individuals of all races and creeds. I was enthralled by the production and the way the narrative flowed seamlessly through all the actors, giving it texture while not detracting from its meaning. The flashbacks were easy to follow and there were absolutely no dead spots in the show. Thank you for choosing to do this heartrending story and thanks to all who made it so successful. I read your review of Snow Falling on Cedars by Kevin McKeon. Where can I get a copy of the play to read?